Hudson the polar bear, one of the stars at the Assiniboine Park Zoo, will soon be joined by his younger brother Humphrey, who is moving to Winnipeg from the Toronto Zoo. The 15-month-old polar bear cub will travel to Winnipeg in the next couple weeks and settle into his new home at the zoo, officials announced Wednesday. No specific date for his arrival has been set yet. "This is very exciting news for us here at the Assiniboine Park Zoo and we are thrilled to welcome Humphrey and have him join our other polar bears in the Journey to Churchill exhibit," Dr. Brian Joseph, the Winnipeg zoo's director of zoological operations, said in a news release. "He's just as lovable as his older brother Hudson and we can’t wait for the community to meet him." The Toronto Zoo posted a farewell message to Humphrey on its website, saying he will leave after the Family Day weekend. 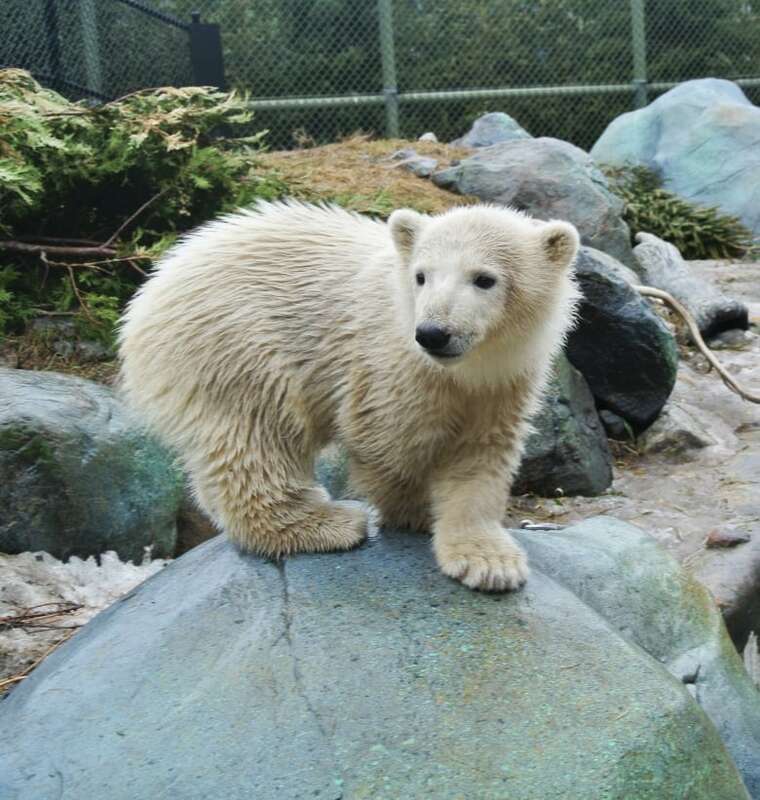 "The Toronto Zoo is proud to have had a role in the raising of Humphrey the polar bear and to have witnessed his growth from a newborn to a healthy, one year old polar bear," the zoo wrote. Humphrey, a 15-month-old polar bear cub, will relocate from the Toronto Zoo to the Assiniboine Park Zoo in Winnipeg in the coming weeks. (Toronto Zoo)"We wish him all the best in his new home!" Humphrey will initially live at the Winnipeg zoo's International Polar Bear Conservation Centre along with two other cubs, Blizzard and Star. "He'll be in a separate enclosure, but the plan that the zoo has is that eventually they'll introduce him to those two other cubs," spokesperson Laura Curtis told CBC News. "They're all around the same age and they'll get comfortable with each other, get to know each other. And then when the timing's right, all three of them will move into the Journey to Churchill exhibit." The addition of Humphrey will bring the number of polar bears at the Assiniboine Park Zoo to seven. In addition to the two cubs, four adult bears — Hudson, Storm, Aurora and Kaska — live in the Journey to Churchill exhibit. "It's extremely exciting and it's wonderful for our visitors," Curtis said. "Journey to Churchill is a very large exhibit but because there's, you know, four bears in there right now, you always get a chance to see them." Curtis said the Journey to Churchill exhibit can hold 12 bears. Both Hudson and Humphrey share the same parents and were the only surviving cubs in their respective litters. Both cubs were closely monitored by Toronto Zoo staff in the early stages of their lives. "They were both one of three, a litter of three, and they were both the only surviving cub in their litter, so they had to be taken away from their mother and they were basically cared for around the clock," Curtis explained. Hudson was also 15 months old when he moved to Winnipeg. He became the first polar bear at the Assiniboine Park Zoo since Debby, its longtime resident, died in 2008 at the age of 42. ON MOBILE? Watch a YouTube video of Humphrey here.